Religion is deeply implicated in human culture, shaping morality and ethics, law and literature, politics and society. It is fundamental to civilizations worldwide, both premodern and modern, and it is never far from the front page of any newspaper. Our faculty and students are therefore eager to work in an interdisciplinary way to engage with economics, government, philosophy, psychology, sociology and other fields in their religious contexts. Students of any religious affiliation, or none, can benefit from a course of study in religion. It is not unusual, however, for a student's interest in religious studies to be motivated by existential questions about human existence and the meaning of life. We believe there is no better way for a person to work out her own answers than by studying the distillations of insight found in the world's religious traditions. To make sense of the complexity of religion one needs to consider a wide range of sources and to do so in a wide variety of ways. Scholars of religion are best served by being both multi-disciplinary and multi-methodological, drawing on paradigms from a host of academic disciplines—from the humanities, social sciences, and natural sciences—and wisely choosing and using the right method for each source examined. To this end, we want our students to learn something of the history of the academic study of religion as well as its many theories and methods, and also to be able to put this knowledge to use in their own research. This is our aim in Approaches to the Study of Religion (REL 200), which is a requirement for all our majors. We also encourage our majors to count one class toward their major that is taken outside of the Religion Department yet is relevant to their course of study. This allows students to integrate insights from another department, and thus develop sophisticated methodologies tailored to their interests. Students in our department should develop an understanding of religion that has both breadth and depth. They should learn the fundamentals and nuances of multiple religious traditions as a way to grasp the range of religious ideas and practices, and they should also develop a deep understanding of one religion, or one religious concept or ritual, as a way to grasp the particularities that religion can engender and the logic of these forms. Hence, we stipulate a breadth requirement, which obliges students to take courses across religious traditions, and a depth requirement, which has students develop a concentration. These requirements offer students complementary ways of understanding religion in its richness and diversity. One way to access the depth of a religious tradition is through a departmental seminar, which is a requirement for all majors. Seminars offer students the opportunity to learn intensively. Students read primary and secondary sources, develop arguments about these materials in class discussion and in writing, and then conduct independent research as a way to explore a particular facet of religion in detail. Students who want to do additional specialized research can work with our faculty to develop either a special studies project or an honors thesis. Another way to access the depth of a religious tradition is to read texts of that tradition in their original language, whether classical or modern, canonical or vernacular. To encourage this, we credit students who complete an advanced language class in which they read religious texts. Language study of this kind is especially beneficial for students who want to continue their studies at the graduate level. In fact, many of our students have gone on to get advanced degrees and have illustrious careers in religious studies or the ministry, as well as in a plethora of other fields. We have designed the Religion Department curriculum to instill a range of skills in our students. We help them cultivate a methodologically sophisticated understanding of religion that is both broad and deep. To this end, our courses help students to understand religion’s role in history and current events; to consider religion’s claims to authority critically yet sensitively; to reflect on religion’s relationship to ethics and moral systems; to recognize religious diversity and develop a culturally sensitive and global orientation; and much more. In addition, our courses inculcate skills that are of fundamental importance to a liberal arts education: critical reading, cogent writing, and how to craft arguments, pursue independent research, engage in public speaking and dialogue, and synthesize the resources of multiple disciplines to pose and answer questions about complex phenomena. 10 semester courses are required, following the guidelines below. Courses counting toward the major may not be taken S/U. Students will normally take five religion department courses, one each from five of the following categories: (i) Philosophical, Theoretical, or Comparative; (ii) Biblical Literature; (iii) Jewish Traditions; (iv) Christian Traditions; (v) Islamic Traditions; (vi) Buddhist Traditions; (vii) South Asian Traditions. Students may count one of the department’s broad-based introductory courses (e.g., REL 105, REL 106, or REL 108) as one of these five courses. Students will take Approaches to the Study of Religion (REL 200). Students will take a seminar in the religion department. Students will develop a concentration by taking three related courses (no more than one at the 100 level), defined by religious tradition, geographical area, discipline, or theme. To fulfill this requirement, students may count one relevant course outside the department, including a language course relevant to their concentration. Students will define their concentration in consultation with their adviser and then submit the required form to the department by the beginning of their final semester. In consultation with their adviser, students may count one relevant course outside the department toward their 10 courses. For relevant outside courses, students should check current offerings by other departments and programs, such as anthropology, art, Buddhist Studies, classics, history, Jewish studies, Middle East studies, music, and philosophy. The religion department encourages study of foreign languages. For further information, students should consult with their adviser or the appropriate department member. The religion department encourages study abroad. With the approval of the department, relevant courses taken abroad may count toward the major. Five semester courses are required. Courses counting toward the minor may not be taken S/U. Students will normally take four courses, choosing one each from four of the following seven categories: (1) Philosophical, Theoretical or Comparative; (2) Biblical Literature; (3) Jewish Traditions; (4) Christian Traditions, (5) Islamic Traditions; (6) Buddhist Traditions; (7) South Asian Traditions. Students may count one of the department’s broad-based introductory courses (e.g., REL 105, REL 106, or REL 108) as one of these four courses. Advanced students in the religion department—normally senior majors who have had four semester courses above the introductory level—may arrange for special studies with faculty members. These courses can be for 2–4 credits, and for a semester or a year. Topics and logistics are worked out with the designated faculty member, and must be submitted to the department for approval. Majors in the religion department are encouraged to apply to the departmental honors rrogram and pursue a significant research project of your own design. Students in the honors program develop, research, write and defend a thesis in close consultation with a faculty mentor. For more information, contact the director of honors. For this year's fall semester Religion courses, see the Smith College Course Search. For this year's spring semester Religion courses, see the Smith College Course Search. You can use the Course Search to view past Religion courses by semester going back to 2004. A document list of Religion department courses offered since 2007 is also available. 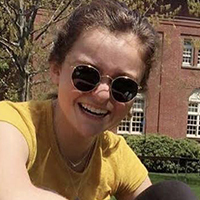 Avery’s interest in religion sparked after taking an introductory world religions course, which opened her eyes to the many ways that religion plays a role in societies and cultures around the globe. A double major in religion and Russian, Avery’s research experiences focus on the Russian Orthodox Church and its relationship to human rights. Starting this semester, she will also be exploring the connections between religion and philosophy. After graduation, she is planning to continue her studies in religion and enroll in a PhD program. Cali grew up in a Reform Jewish household and never had a bat mitzvah. She came into Smith intent on architecture, but fell into the religion major after taking an introductory course on the Bible. Her academic interests include secularity as a religious identity and how architectural spaces complement spiritual beliefs. In addition to studying religion, Cali is a coxswain on the varsity rowing team and a member of the improv group on campus. The religion department takes a decidedly global approach to the study of religion, and hence we offer strong support to our students who wish to study abroad. Religion majors have studied on every continent in the world, in almost every imaginable environment, from Smith programs in Japan and India to independent learning projects in Africa, from yurts in Mongolia to the most prestigious universities in Europe. In addition to Smith College programs, there are Smith-approved programs in virtually every part of the world, from Samoa to Europe, Asia, Russia, the Americas, and everywhere in between. Visit the Office for International Study for a complete listing of approved programs. Most study abroad programs offer courses that will count toward the requirements for the religion major. Credit toward the major is also offered for relevant language courses. Students contemplating study abroad should consult with the departmental study abroad adviser to learn more about the requirements and transferring credits. Each year the Department of Religion has the option of awarding the Clara Willoughby Davidson Alumnae Scholarship to a Smith College senior or recent graduate who pursues an advanced degree in Biblical studies and/or philosophy of religion, or in a related field that involves coursework in one or both of these disciplines. Preference is given to applicants who have completed a substantial number of relevant courses while at Smith. Students considering an academic track, seminary, divinity school, or rabbinical school are encouraged to consult with the appropriate faculty in the department well in advance of their senior year. A student competing for one or more of the prizes below should submit a printed copy of her paper together with the required cover sheet to Phoebe McKinnell, Wright Hall 106, by noon on the last day of classes in the spring semester. One need not be a religion major to submit a paper for a prize and students may submit more than one paper. Prizes are typically awarded to midsized and longer papers that reflect substantial research and innovative thinking. 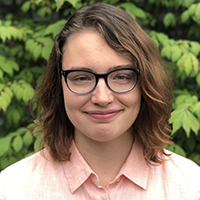 The James Gardner Buttrick Prize may be awarded annually for the best essay written by a Smith undergraduate on a subject in the field of religious studies. Miles Bond '19, "'God Don't Look Like That': O'Connor's Christ Tattoo as Kierkegaard's Christian Truth"
Enas Jahangir '18, "Homosexuals or Homophobes? Beyond the Binary in Islamic Law and Literature"
The Henry Lewis Foote Memorial Prize may be awarded annually for the best essay written by a Smith undergraduate on a subject in the field of biblical studies. Halley Haruta '20, "The Divine Office as the Way to Pray without Ceasing"
Hunter Myers '18, "American Jewish Anti-Zionism: A Historical and Contemporary Analysis"
Religion majors have studied on every continent, in almost every imaginable environment, from yurts in Mongolia to the most prestigious universities in Europe. Complement your religion major or minor with a deeper focus in Buddhism.